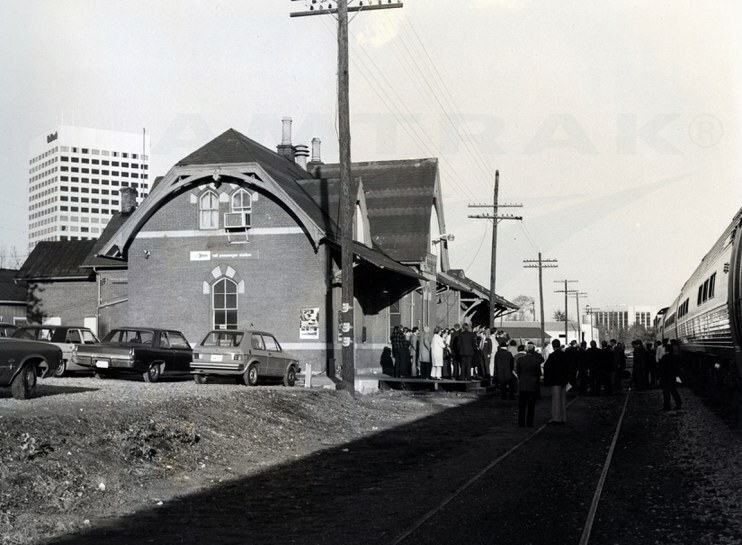 The former Amtrak station in Rockville, Maryland, in the late 1970s. I found the photo above in a slim, bright yellow box along with others that appeared to depict the same train at various small depots. Turning it around, the photo was unmarked, providing little clue as to where this scene took place. But the more I looked at it, I couldn’t help but think that the building seemed familiar—and then I realized that it is located just a few miles outside of Washington, D.C., in the town of Rockville, Maryland. Although it still stands, the historic late 19th century passenger depot is no longer used by Amtrak or any transportation provider. wall next to the utility pole. In the early 1980s, the Washington Metropolitan Area Transportation Authority, which operates the region’s subway and buses, pushed out into the Maryland suburbs. It constructed an intermodal transportation center in Rockville to house its services along with Amtrak and commuter rail lines. To make way for the new complex, the old depot was moved south approximately 30 feet. Refurbished as offices, it now stands amid mature trees next to the railroad right-of-way and is visible from the Capitol Limited (Washington-Chicago). In addition to Rockville, the yellow box includes photos of similar scenes in Brunswick, Maryland, and Martinsburg, West Virginia. Each includes a crowd, but the way the people are milling about, they appear to be gathered for a special occasion. Therefore, it is reasonable to believe that the images depict the inaugural run of the Shenandoah (Washington-Cumberland-Cincinnati) in October, 1976. An early flyer for the train noted, "Now for the first time you can take in eye-opening daytime views of the beautiful Blue Ridge and Allegheny mountains as you travel..." It also touted the use of new stainless steel, single-level Amfleet cars on the Shenandoah—they are clearly visible in the photos. Introduced in 1975, the Amfleet cars were the first rolling stock exclusively manufactured for Amtrak. Shenandoah passengers could initially transfer to the combined Mountaineer/James Whitcomb Riley (later the Cardinal) at Cincinnati for connecting service to Chicago. Since the discontinuance of the Shenandoah in 1981, the portion of the route between Washington and Cumberland, Maryland, has been covered by the Capitol Limited. The Rockville depot in May, 2014. Studying the photo carefully, little details start to emerge, such as the red, white and blue paper conductor's hats tied around the utility pole. Amtrak still has a version of this hat that is given out to children at special events. Posters similar to the one tacked on the depot’s wall promoted various features of the Amfleet cars. Above the pointed arch window is an original Amtrak sign spelling out the station name against a blue background. It also incorporates the company’s first service mark, a stylized arrow that was retired in 2000. And standing close to the train is a service attendant dressed in a crisp, white, double-breasted jacket, helping passengers up and down the stairs. Closing your eyes, it’s not hard to imagine yourself among the crowd, catching bits of conversation and admiring the gleaming silver cars in their patriotic livery. Were you on the inaugural run of the Shenandoah? 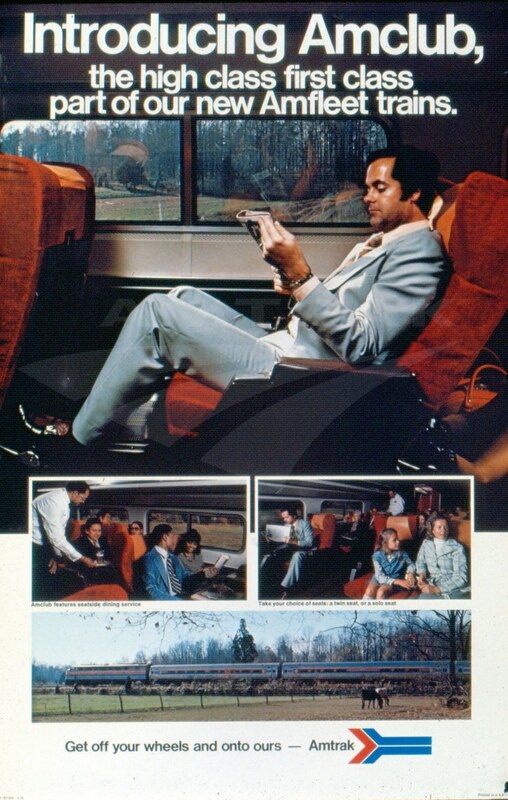 Do you have memories of traveling on this train? Share them with us in the comments section below.